My year as 2013 Teacher on the Trail™ is coming to a close and I have yet to wrap my brain around the fact that it actually happened. I can’t finish this adventure without a few thank yous. 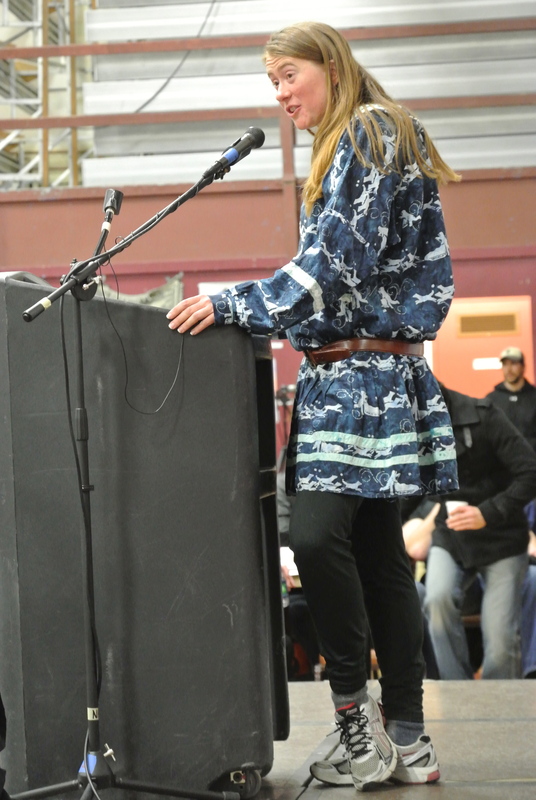 Thank you Andrea Aufder Heyde (Finney) for having the tenacity to pursue bringing the Iditarod into the classroom by experiencing it first hand. Thank you also to the Iditarod Trail Committee for seeing the value of her experience and continuing the Teacher on the Trail™ program. Thank you to all the mushers, vets, pilots and volunteers who let me ask questions, take pictures, and who stopped what they were doing to talk to students on Skype at different checkpoints along the trail. Thank you to the Waupaca School District, Waupaca Learning Center, and my class for all of your support during the entire school year. Finally, thanks to all the teachers and students who followed my blog making this the largest classroom an educator could wish for. At the Volunteer Picnic at Iditarod Headquarters in June I will officially pass the torch to Jennifer Reiter who is the 2014 Iditarod Teacher on the Trail™. I’m so excited for her and I look forward to reading about her experiences. Nome, Alaska is a city of almost 4,000 residents that sits on Norton Sound at the edge of the Bering Sea. There is a lot to see and discover here, but the week the Iditarod comes to town, there is something for everyone. Events began on Monday, March 11 with workshops, talks, tours, an Arts & Crafts Fair, and Fine Arts Fair to name a few. 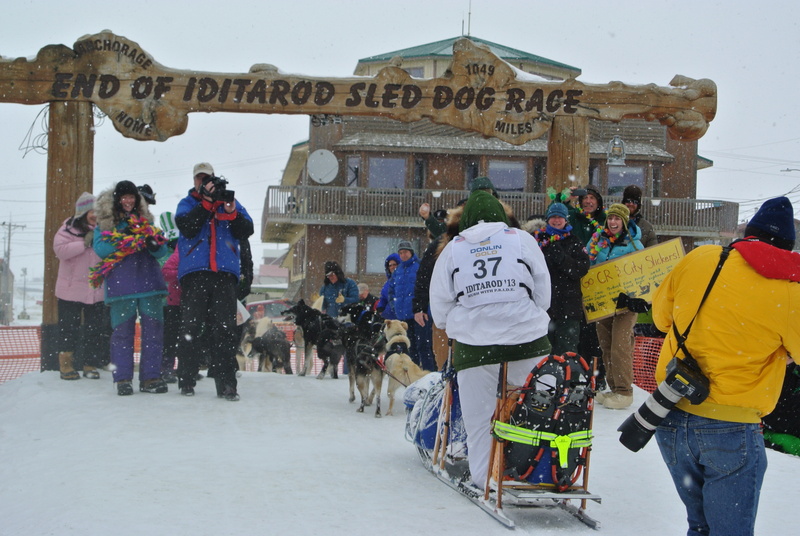 My time here has been busy – not only with Iditarod – but trying to fit all the other interesting events into a day. One of the highlights includes watching Velvet, a pet reindeer, go through town the back of a pick-up. I also attended the largest basketball tournament in the world. I can’t forget about the beautiful sunsets over the Bering Sea and the poetry reading by Richard “Hello Central” Benevelle. I didn’t drive anywhere because gas prices are hovering at $6.15 a gallon and I didn’t grocery shop because there were fabulous cooks at the church where I am staying, plus groceries are very expensive. I was even interviewed on a radio show for local station, KICY. Read more about Nome at their website, Nome, Alaska and visit the Nome, Alaska Visitor’s Center website to read more about the rich history of this city. True to its own tagline, there is no place like Nome. Last fall I contacted former 2nd grade teacher from Ketchikan, Alaska, Angie Taggart to ask if I could follow her training for the 2013 Iditarod and share it on this blog. She immediately agreed. Angie worked hard training with little snow and even some winter rain. 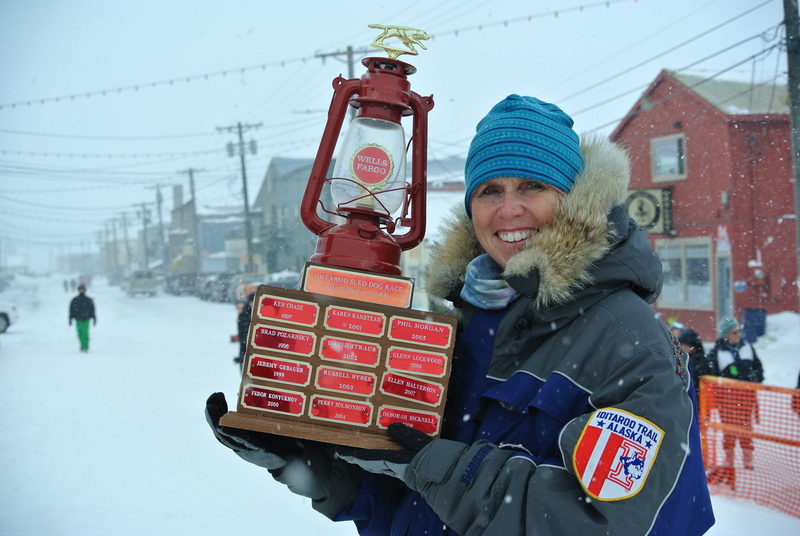 Last night, at 11:50 Nome time, Angie finished the race under the Burled Arch. I started watching for her a little after 11. Looking down the trail on the Bering Sea, way off in the distance, we could see a faint light bobbing up and down. Angie! As she got closer, the light got brighter. Her hard work paid off as she was met by family and friends. In her interview, when asked how she felt, she replied, “Sad.” Sad the race is over and sad that she won’t run it again. 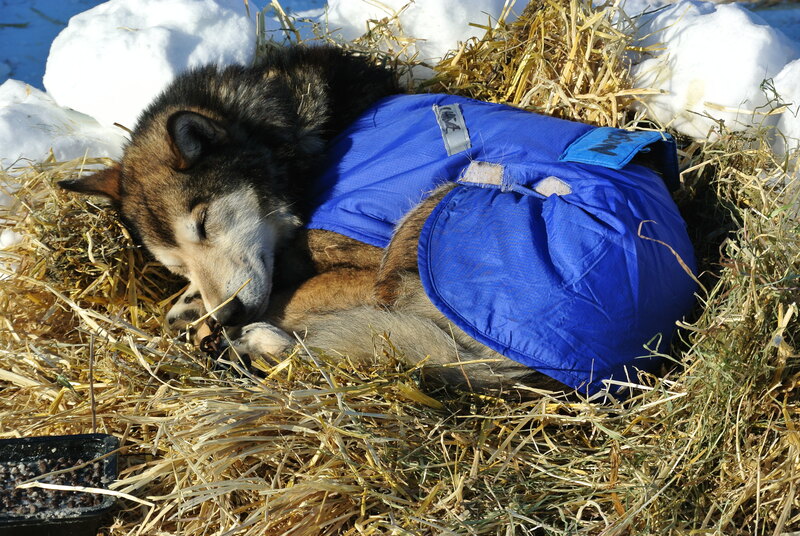 Sled dog racing is an expensive sport and Angie feels she needs to get back to teaching. Angie’s decision to run the Iditarod was the realization of a dream. Good for you Angie, thanks for sharing your training, and welcome to Nome. Dogs and crates everywhere! That’s the dog lot in Nome. 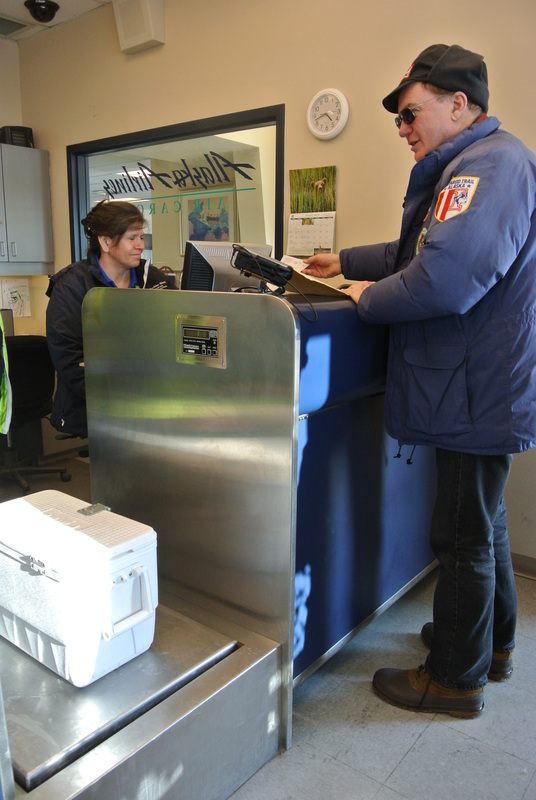 Once the team crosses under the Burled Arch, Dr. Stu Nelson, Chief Veterinarian does a quick check on each dog. Every dog on the team gets lots of pets and love from the musher, family and friends. They have, after all, just run about 1,000 miles – they’ve earned it. After that, the team is run down Front Street toward the Mini Convention and parked in the big dog lot where they join dogs from other teams that have finished. 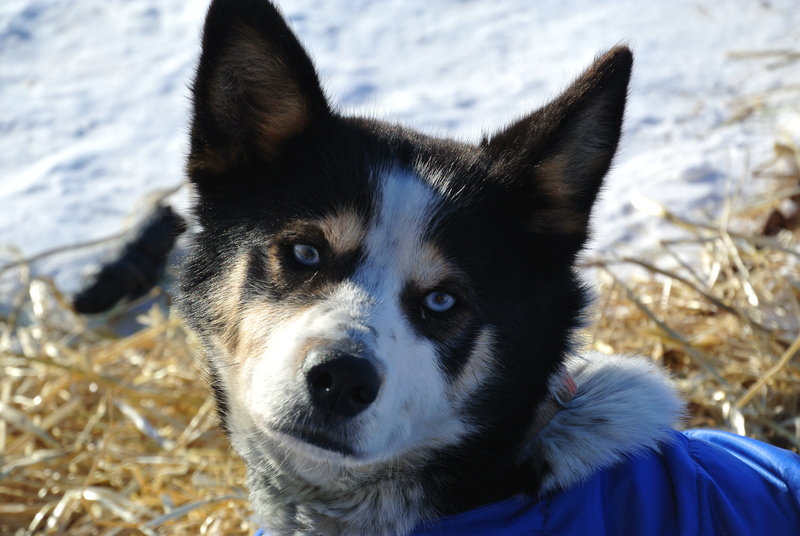 They are cared for by the mushers and handlers and given a more thorough check up by vets. Each dog has a crate that is filled with straw and they bed down for a well deserved rest. The mushers are in charge of flying them back either to Anchorage or wherever their final destination may be. 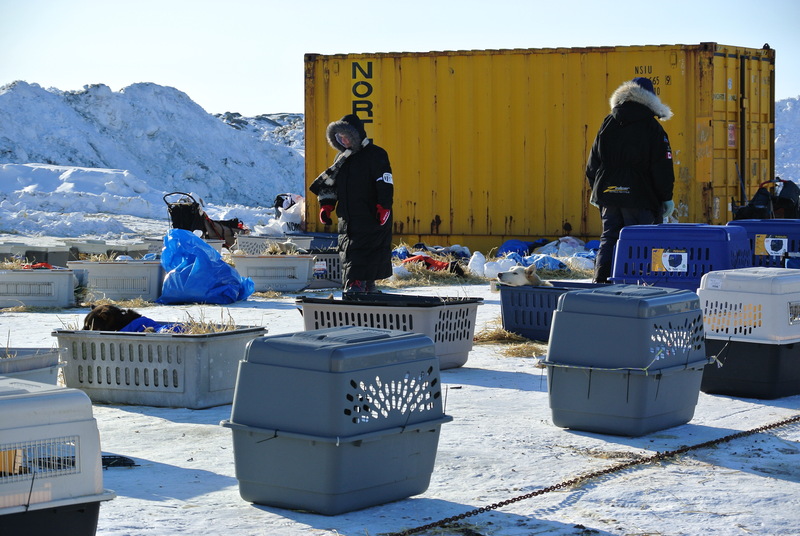 The dog lot in Nome is a temporary home for Iditarod dogs. Soon the dog lot will be empty and the 2013 Iditarod will be over. 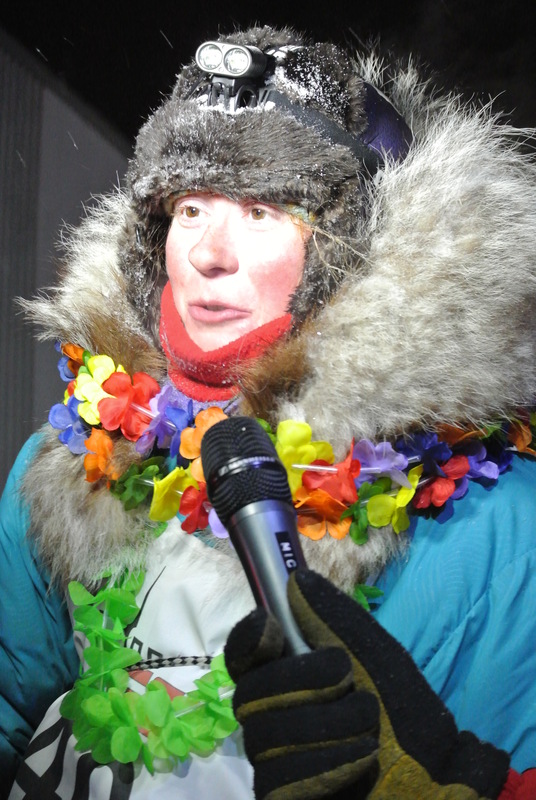 Before I came on the Iditarod Trail, many students thought I was a musher competing in the race. My answer was always, “No way, those guys are crazy!” Now they may be crazy, but I say that with the utmost respect. The top 10 finishers have come in and they have been praised by the media and fans for their performances. 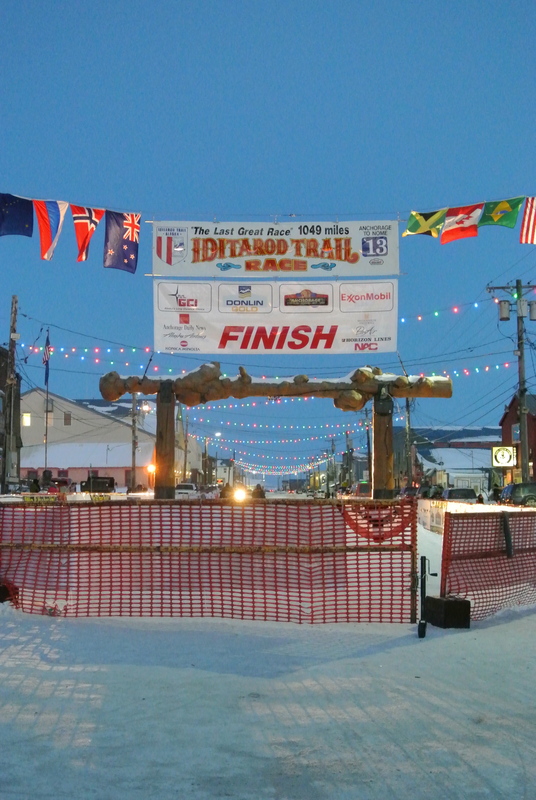 As of this writing, 43 mushers have come through the chute in Nome and finished the Iditarod under the Burled Arch. 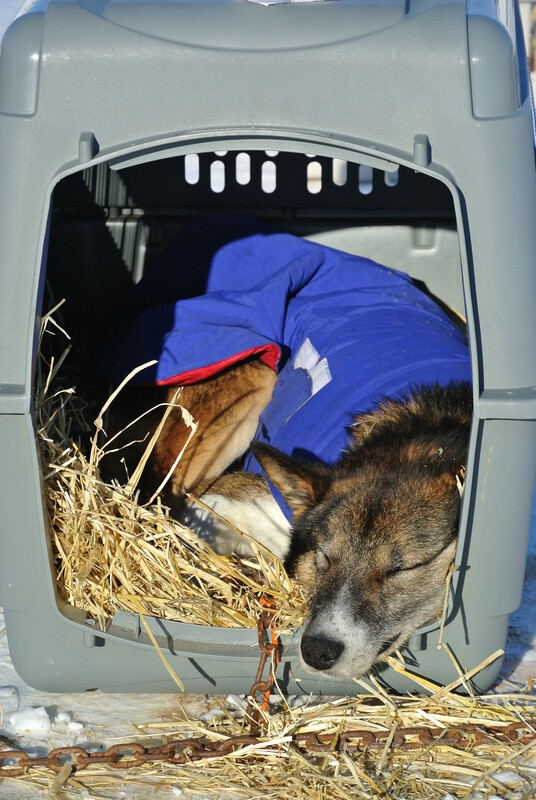 Some mushers had to withdraw or scratch from the race. But there are still 11 mushers out there. 11 mushers I admire for their courage to run in the Last Great Race. Keep cheering these mushers on – they deserve it. A student from Westport, CT asked me why they collect dog pee. Pee is collected so it can be tested for drugs. Like human athletes, they are looking for any kind of drugs that make the dogs run faster and stronger. Over the past few days, they took the final collections here in Nome and sent them off to a drug testing lab in Colorado. This is the same lab where they analyze pee from greyhounds and some race horses. Once again, security was a factor. 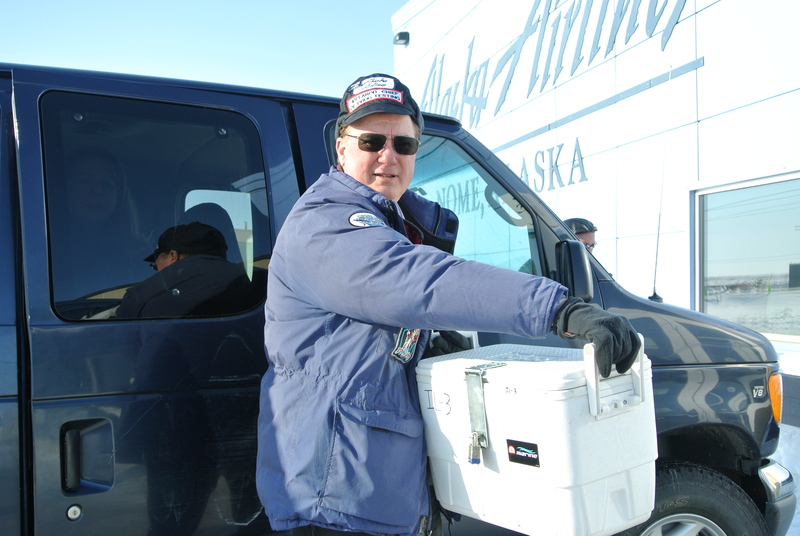 Dr. Morrie, who oversees the collection, and Marilyn who is on the collection team, brought the locked cooler to Alaska Air to send it off. After the paperwork was completed and the “keep frozen” stickers attached, it was sent off to the lab in Colorado. Go doggies has a whole new meaning for me. That’s the last word on dog pee.